Do you want to make a difference with your art? UNICEF @ FIU—the official student-run chapter of the United Nations Children Fund—is giving both amateur and professional photographers the opportunity to showcase their talents and promote a good cause with their latest fundraiser: a photo contest. The group advocates for children rights, educating the university and local community on the many challenges marginalized youths face across the world and inspiring compassion and charity. They then organize several fundraisers, whose proceeds are sent back to UNICEF’s headquarters in New York City. The contest’s theme of “children first” falls right in line with the club’s mission to “educate, advocate and fundraise” as its president, Ayleen Arauz, puts it. Participants are welcome to submit artwork or photographs that are 8×10 prints they feel capture the essence of the theme. Each submission requires a $5 contribution to UNICEF @ FIU—and with a small donation of $1, anyone is welcome to vote on which photo they find the most representative of the theme. 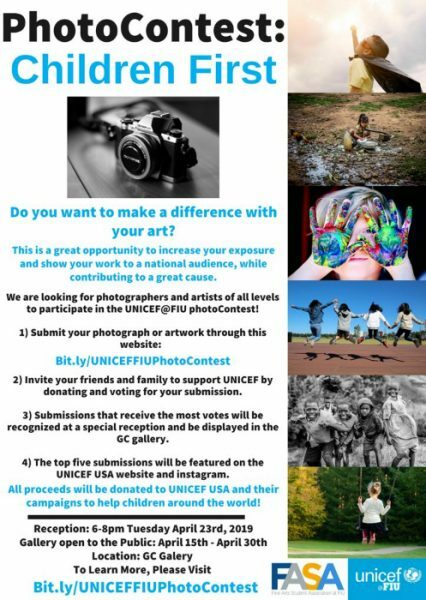 The five submissions with the most votes will be spotlighted on the UNICEF USA website and official Instagram while the overall most popular group of submissions will be featured at the Graham Center gallery for two weeks. The gallery will also host a reception in honor of the winning photographs on April 23. The deadline for submission is March 27. To submit your photo click here.